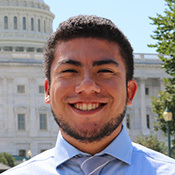 José Arnulfo Cabrera is one of two NETWORK Government Relations Associates. He works with NETWORK’s Lobby team and coalitions to advocate to advance federal policies inspired by Catholic Social Justice. José graduated from Xavier University May of 2018 with a degree in Entrepreneurship and a Minor in Justice and Peace Studies. While at Xavier, he worked at Intercommunity Justice and Peace Center as the Immigration Program Organizer where he organized the Youth Educating Society, YES, group.